You know how the holiday gift-giving and decorating season always seems to sneak up on you? It's time to plan NOW, especially if you want to give handmade presents this year! Many of the same designers are featured in 'Tis the Season to be Felt-y as are in the first book, Fa la la la Felt, but all of the projects are new! You don't have to buy both books (unless you want maximum variety) because the basics are repeated in the new one...what you'll need and how to work with felt. It really couldn't be much easier since felt doesn't unravel when cut! Still, it pays to use good quality materials and you'll learn all about that in either book. There are more types of felt than I ever imagined, being most familiar with the cheap acrylic felt found in craft stores. But there is also wool, wool blends, eco, bamboo, and other specialty felts. The authors even show you how to felt wool clothing to use in these projects to that you can add upcycling to your accomplishments. Then, of course, there are a gazillion embellishments you could try, but as a jewelry maker, you probably already have plenty of the ones suggested. Templates are included in the book. The tools are very basic. Techniques are also very basic, such as transferring patterns and the stitches you need to use. Some projects are even no-sew, so get out your craft glue! The projects are divided into ornaments, decorations, and stockings, covers, and bags. 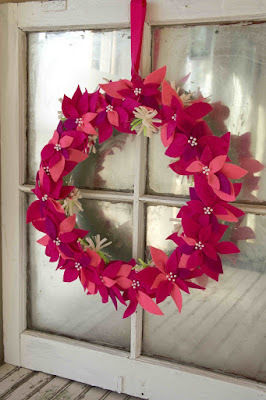 I really love the poinsettia wreath (page 76) by Suzie Millions, shown above. 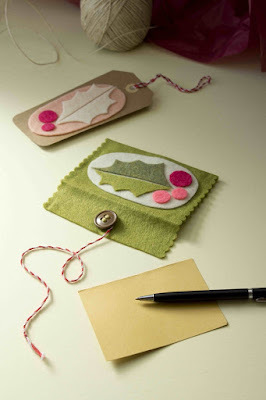 But what about simple little projects like the gift tags and card sleeves (page 112) by Jennifer Jessee shown below? You could put BEADS on those!